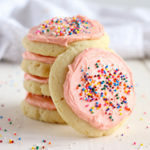 These Soft and Chewy Frosted Sugar Cookies are the perfect sweet treat that's easy to make and tastes just like your favourite Lofthouse sugar cookies! Add some gel food colouring, if desired, and mix until the desired colour is reached. These cookies keep well in an airtight container for about 2 days at room temperature. The frosting will transfer, so it's best to store them in a single layer or with parchment paper between them.